My blogging hasn't been happening much this year. I have quite a few things I've made over the last six months - some even photographed - that I haven't posted yet. 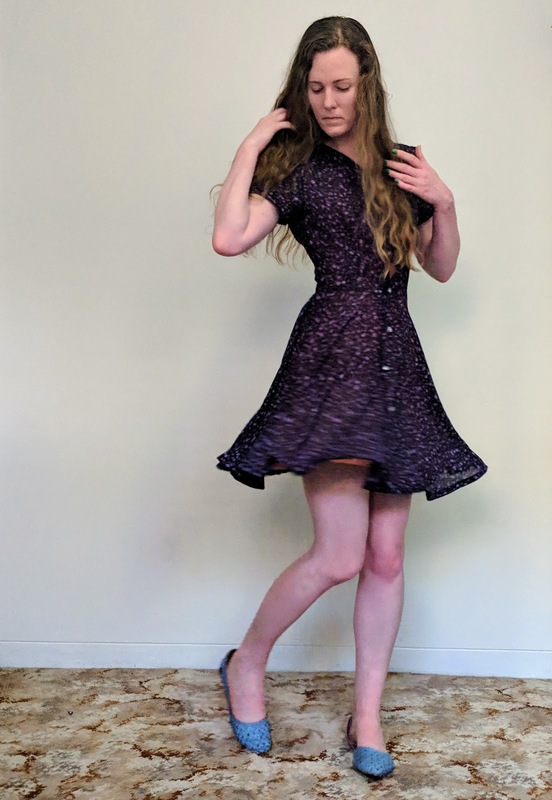 So this dress is my first start in changing that around. The skirt is the Patti Pocket Skirt from Amy Nicole Patterns. 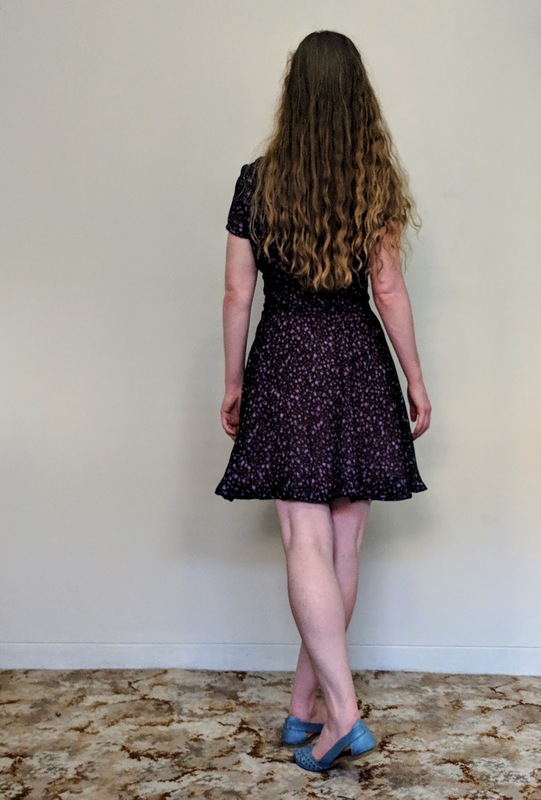 It has front and back pleats and large pockets - the white whale of dresses and skirts. These pockets are cut so that they're slightly wider than side skirt piece, making them pretty roomy and much more functional than pockets often are. I also like that the placement of the pockets is in the front rather than in the side seams as it makes them much more practical. The fabric is a light cotton sateen from Pitt Trading with diagonal stretch and a good sheen. I love the print, it's a check but nothing like other checks. It's very pop art, or like almost cartoon-like with the roughly drawn think black lines and deep and vibrant greens and blues. It's lightweight but has just enough body to hold a bit of shape and keep the pleats sharp. 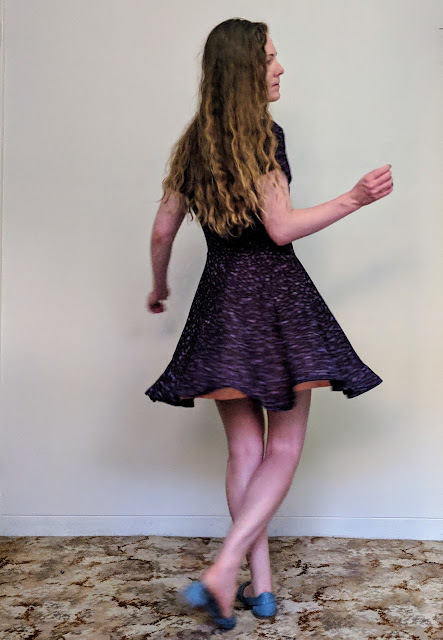 I decided early on the skirt half I wanted for this fabric and had an image in my head for the bodice, so looked through my patterns to find what matched the picture in my head. The bodice is from everyone's favourite pattern in 2010-11, Simplicity 2444, sadly now out of print. 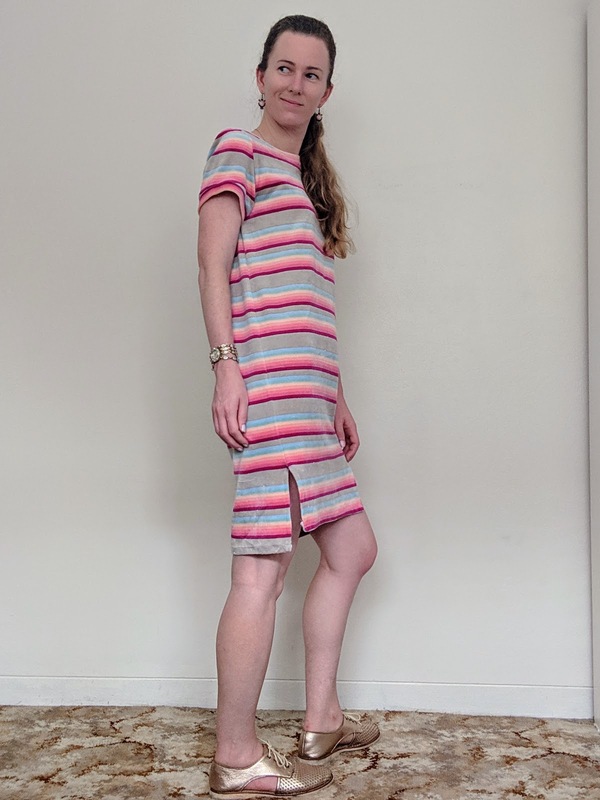 It has been a while since I made this pattern, so I'd forgotten that the sleeves have very little ease meaning I can't entirely raise my arms in this dress. I'm hoping that after a few washes the fabric will soften and I'll get a little more movement. I've made both the skirt and pattern I used for the bodice before, so it was straightforward to combine the two. The only major change I made was moving the skirt zipper from the side to the back so that it matched the bodice. I don't think I added in quite as much extra fabric at the centre back for the zipper and seam as I as meant to, so the back pleats are a little close together and I had to be careful not to catch the pleat as I stitched the zipper. Other than that this was a quick and easy make. 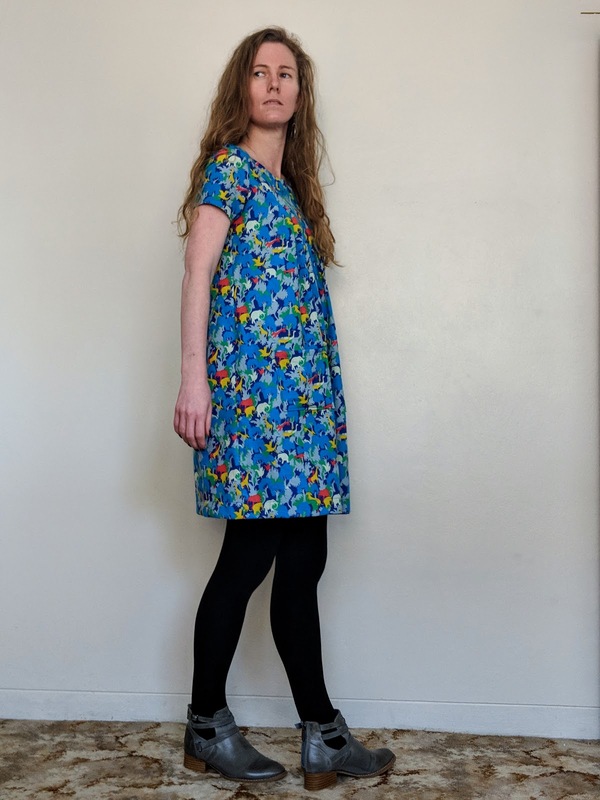 I made this dress to be able to wear to work or casually, and to wear all year round - with tights in winter and bare-legged in summer. 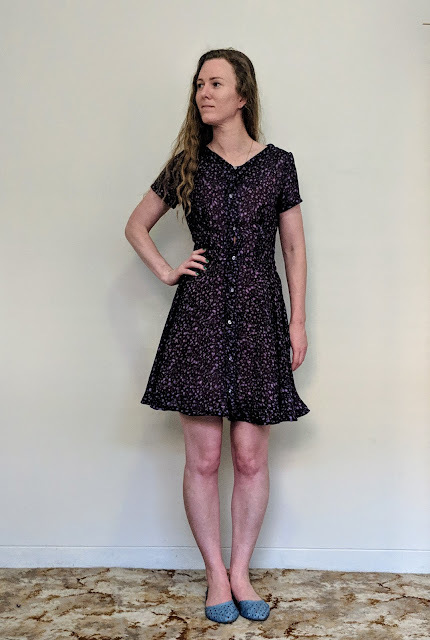 It's a versatile dress and I'm really happy with how it turned out. 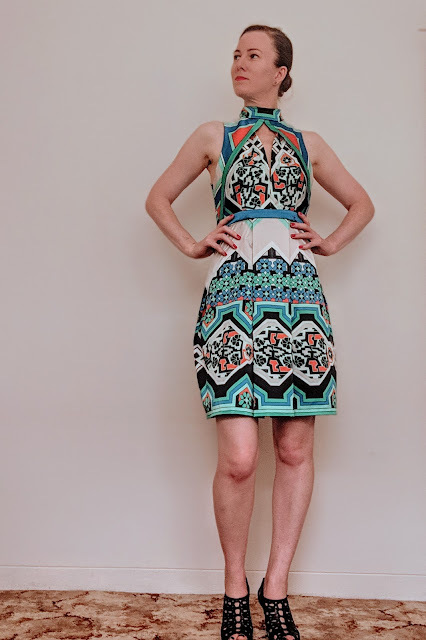 Last night was Sydney Frocktails 2019, where the sewing ladies of Sydney (and beyond) get together in our fancy handmade makes to have some drinks, some fun and feel each others' clothes without it being weird. 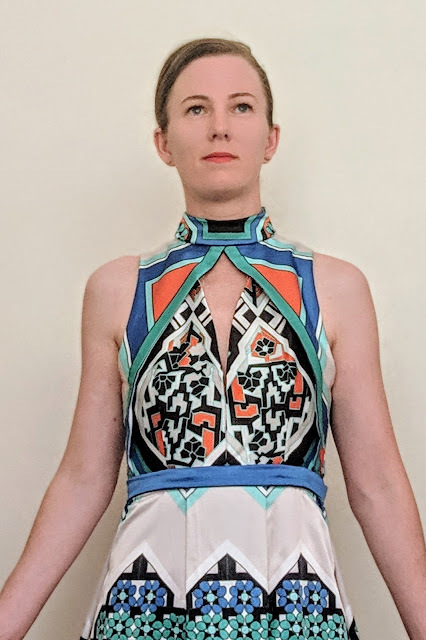 This dress, the Geometry Dress - named for both the construction and the print - was started last weekend and finished at 4pm yesterday. In total there's probably around 20 hours of work in this dress. The fabric is one I bought from Tessuti somewhere around 5 years ago, I think. It's a cotton sateen with a very high sheen. 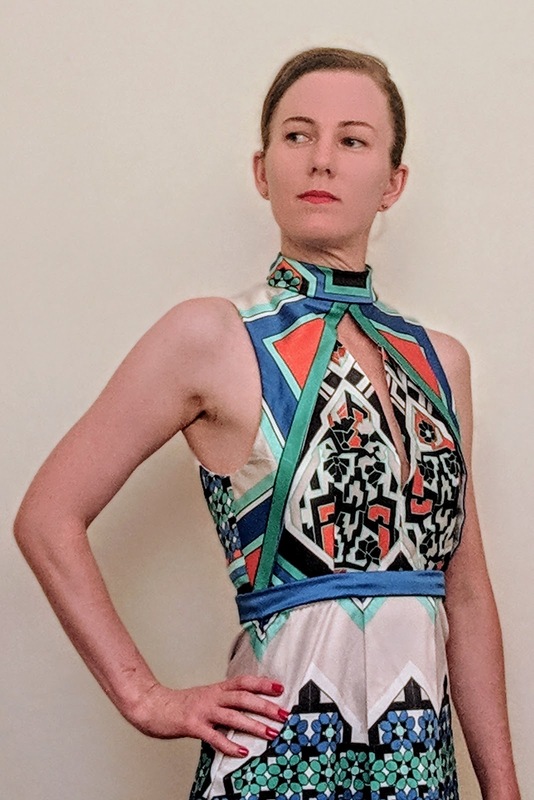 In fact, quite a few people at frocktails were surprised when I told them it was a cotton, thinking it was a satin or even an African wax print. It's surprisingly lightweight despite the look, and is wonderfully soft and smooth with a small amount of stretch. I decided I wanted to use a fabric I already had for my frocktails dress, given I have a very large stash. 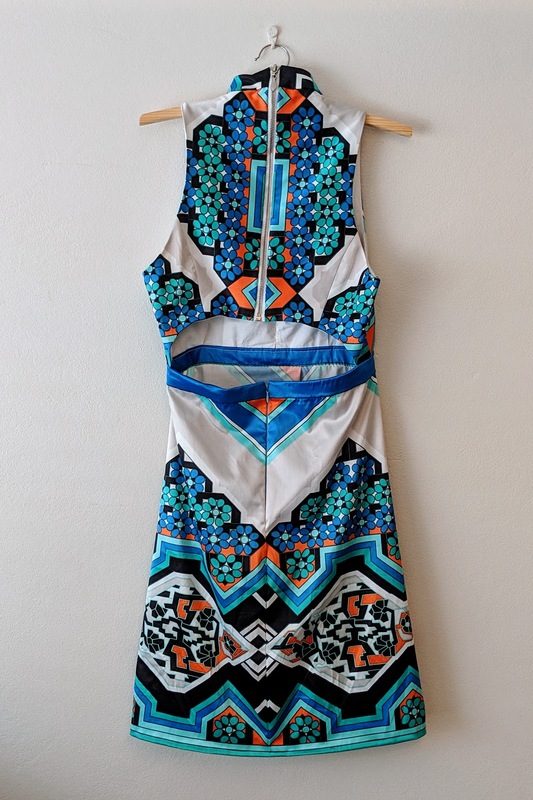 I've had this fabric for a while and always thought it would make a great cocktail dress of some sort. Having two panels of the print, I figured I'd use one for the skirt and one for the bodice, but didn't have any ideas of how I'd actually do it. I looked through all the patterns I own but nothing grabbed me, so went to Spotlight to look through the pattern books. I still had no idea at all of what shape or style I wanted so came away empty handed. 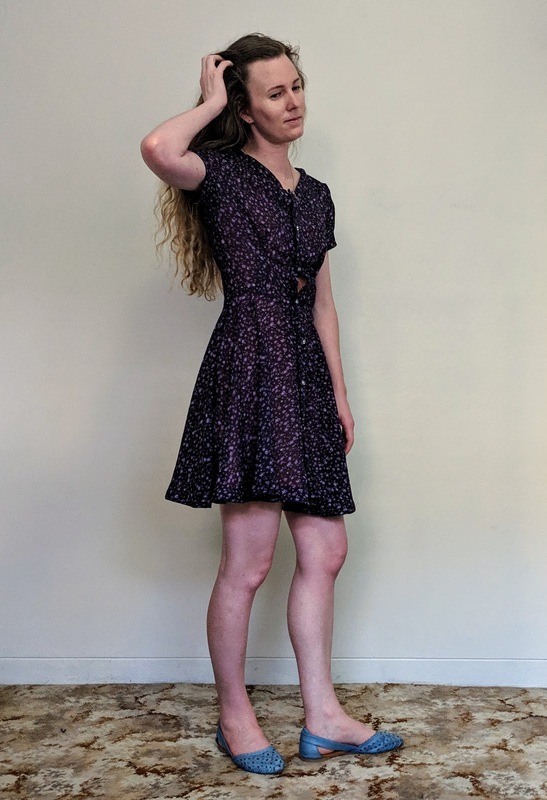 Then I saw a sundress pattern that was too casual but had a nice minimal bodice which inspired me to find something with some form of cut outs. So I went to Lincraft in my lunch hour a week and a half ago with a half-formed thought, searching for the pattern to complete the thought. 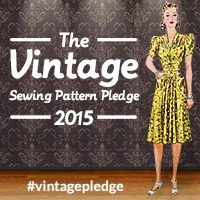 The pattern is a Vogue designer pattern by Rebecca Vallance, number V1545. 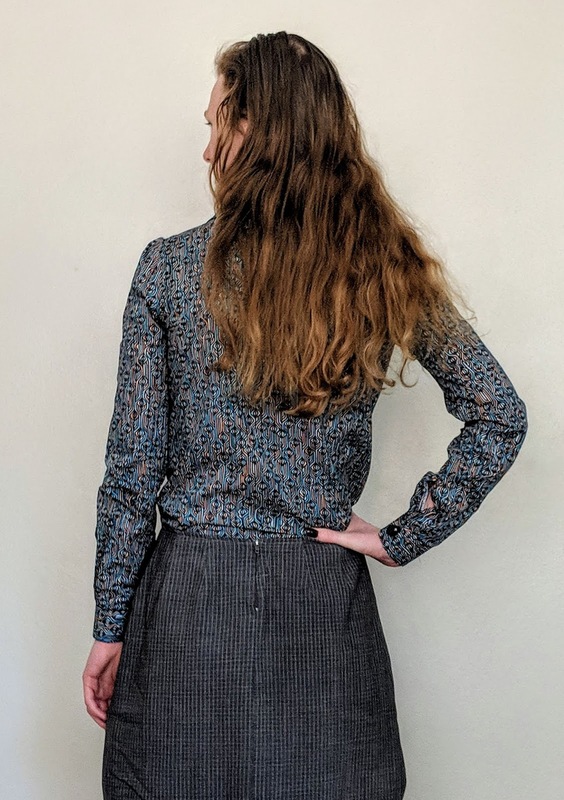 I changed the pattern to a plain pleated skirt to show off the fabric print. I really should not have chosen to make something so difficult a week out from the event, but I never pay attention to the difficulty rating on patterns. 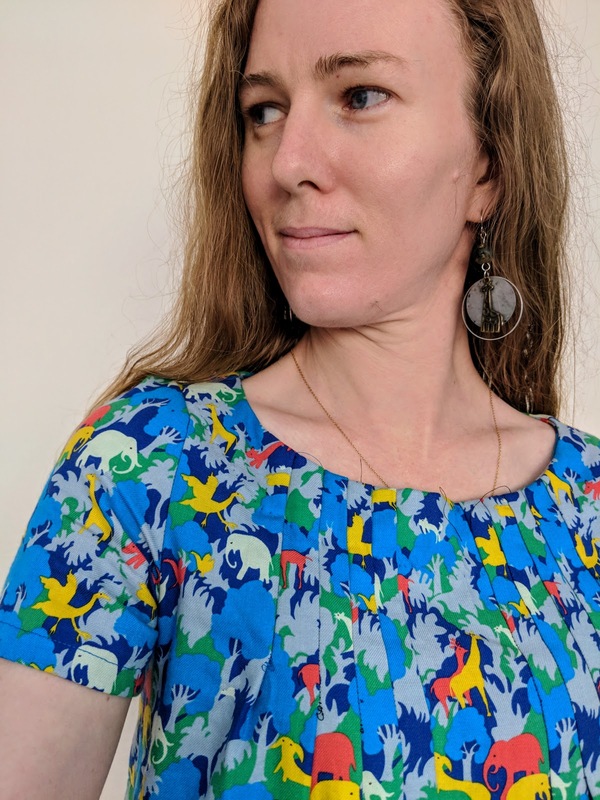 My thoughts were simply the pieced bodice could work with the almost patchwork nature of the print, but without really considering how exactly that would work out. Working out the pattern placement took about four hours to get right. 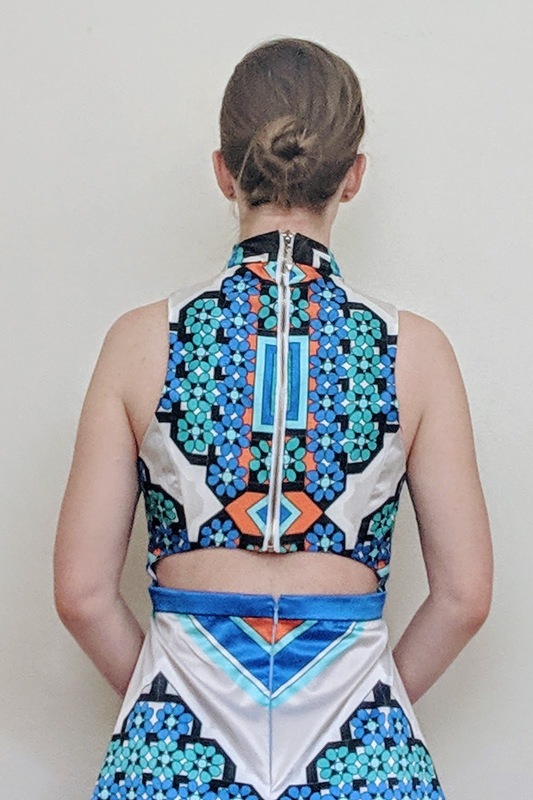 The print is a panel, and I had two panels so figured I'd use one for the skirt and one for the bodice, using the different designs in the panel for the different pieces of the bodice. The print on the fabric isn't actually symmetrical, so I couldn't just fold it in half and cut the pieces together. Instead, I cut one of each bodice piece out with the fabric print side up, then laid it print side down on the fabric matching the lines as well as possible and cut out the opposite side. It was a laborious process, but the final result made it worthwhile. The pattern is relatively difficult, but the biggest issue was how time-consuming it was. Obviously the four hours of pattern placement was the biggest single amount of time. The blue and red triangles and stripe on the edge of the panels were an obvious choice for the front overlay and the waistband. Then I kept changing my mind about whether to have the geometric shapes for the front or the back. In the end the back and side back pieces fitted better on the floral, and the finished diamond shape on the back is better than I could have planned. 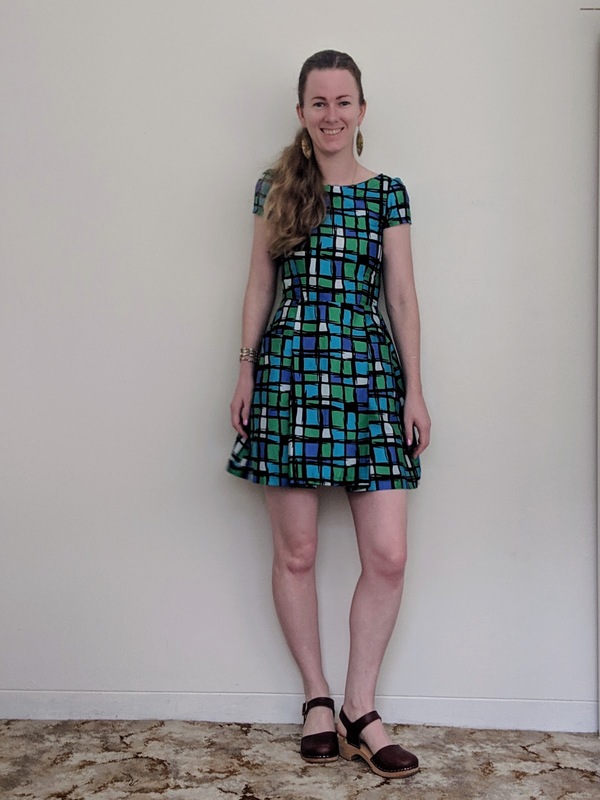 I also tried to get the skirt to pattern match, which worked pretty well at the top with the invisible zipper, but got slightly out of alignment near the hem. But the teal stripes match up, so the bit of unevenness in between doesn't really matter. The bodice is fully lined and all seams bar the armscyes are understitched. I do love how understitching keeps the lining from peeking out, but it does significantly increase the amount of time it takes to sew. The lining, which is just a heavy cotton, gives the bodice much more structure than the cotton sateen alone, but the different weights of the fabric definitely benefited from the understitching. All the finishings are done by hand, apart from the hem. But hand stitching a neckline, waist, and 15 inch metal zipper takes a long time. And zipper tape for a heavy metal zipper is not good on needles or fingers - my left pointer finger has a callus and also a bit of a hole where the needle pushed back into the skin when it didn't want to go through the tape and fabric. The waistband, in comparison, was a very easy sew. Although the hem ended up being sewn by machine, I luckily had a forest green that perfectly matched the narrow stripe between the teal and mint stripes so the stitch line is only visible when looked at closely. As well as changing the skirt from the original pattern I reduced the front opening of the dress. In the original pattern the front is open all the way down to the waistband, but that's really not practical to wear, so I hand stitched in the back to keep them together. I also added a quick stitch where the overlay crossed the front bodice pieces to keep them from gaping apart. 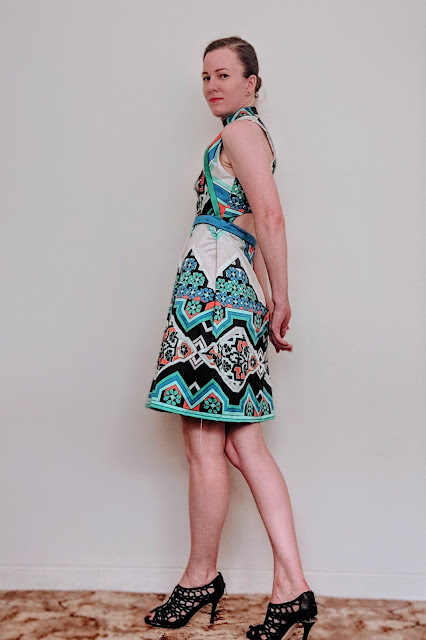 These were quick minor edits, but meant I could be comfortable and confident wearing the dress knowing it was going to stay where it was meant to. One of the best things about frocktails is seeing the great variety of styles people wear. Getting to make something that's just fun to dress up, rather than making practical clothes for work or everyday wear. Seeing women in velvet, sequins, brocades, circle skirts with petticoats and all sorts of colours and prints was great, and a great reminder that sewing is not only a practical skill, it can reflect each person's individuality. And it's a wonderful community to be part of. Ready to do it all again in September! My second make for 2019 is the Inari Tee Dress by Named Patterns. I'm a few years late on making the Inari compared to much of the sewing community, but bought the pattern when Named had a pattern sale mid last year. It was winter here when I bought it, but now that it's summer I decided it was time to make it. The fabric, from The Fabric Store, is a beautiful velvety plush jersey. 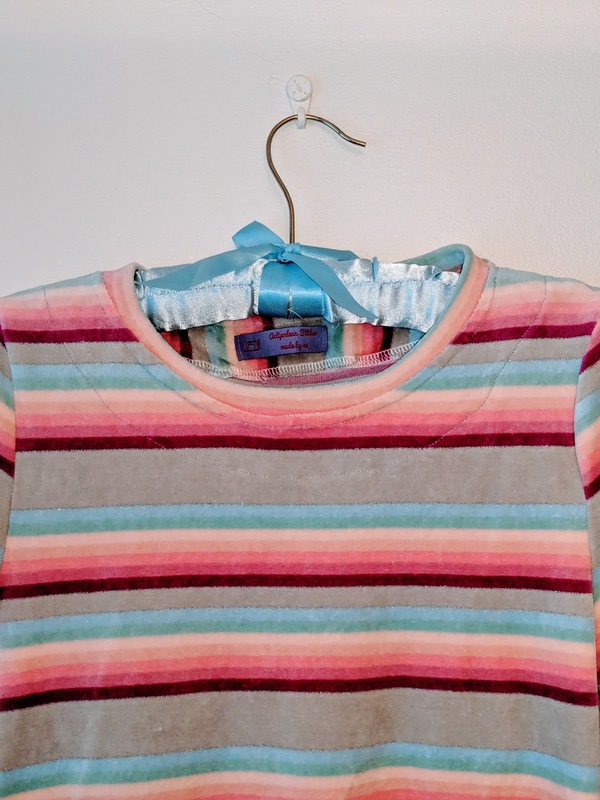 It's a Marc Jacobs fabric, rainbow stripes on a warm grey background. There's also a very fine silver stripe on either side of the grey stripe, but it doesn't show up as clearly in pictures. The fabric reminded me of 80s kids character Rainbow Brite, hence the name of the dress. The fabric is wonderfully soft and sewed up quite easily, apart from the huge amounts of fluff. Especially when overlocking the seams. There aren't all that many seams to this dress but I still needed to clean my overlocker twice to get rid of all the fluff around the knives and needles. Even with the fluff, the fabric did not catch or slip on either my normal machine or my overlocker. I did my best to pattern match at the side seams, but jerseys never quite cut out perfectly evenly so the stripes are a tiny bit off under the arms. The good thing with a knit fabric is that it's easy to slightly stretch one side so that it gets back in line with the other, so I made sure the bottom of each side seam matched and adjusted up the the underarm seam, so the more visible parts of the side seam have pretty much matched stripes and the parts that aren't seen unless I raise my arms are maybe a few millimetres off. The Inari has a bit of an unusual shape - it's quite quite fitted at the neckline, sleeves and bust, almost tent-like through the waist and more fitted again at the hips and legs. The split side seams and shorter front hemline accentuate the more fitted bottom of the dress. This gives it a feel of being casual but not lazy, effortless rather than couldn't be bothered. 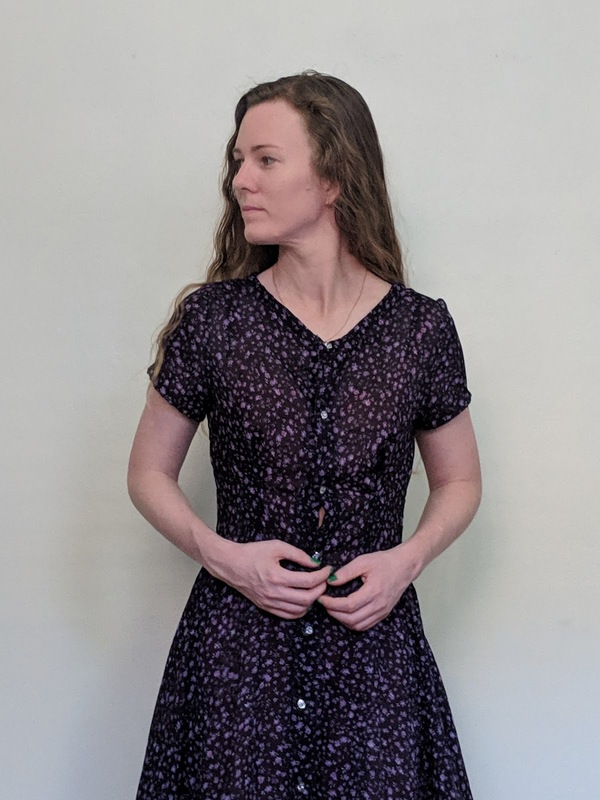 I wasn't completely sure of the sleeves when I first finished the dress because the underarm is longer than the outer cap, but I'm starting to like it more now. Because the jersey is effectively a velvet it is relatively warm. 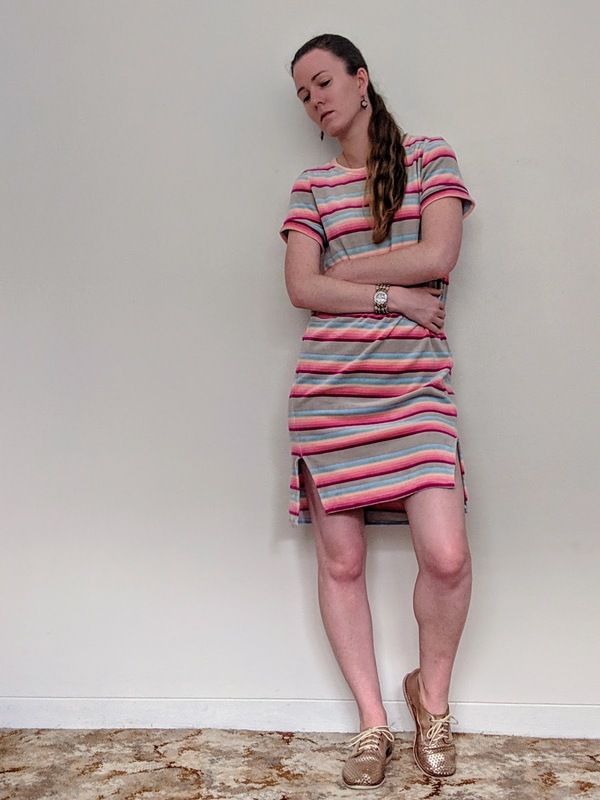 Even with the loose fit of the Inari, this summer of record-breaking temperatures has often been too hot for the dress. 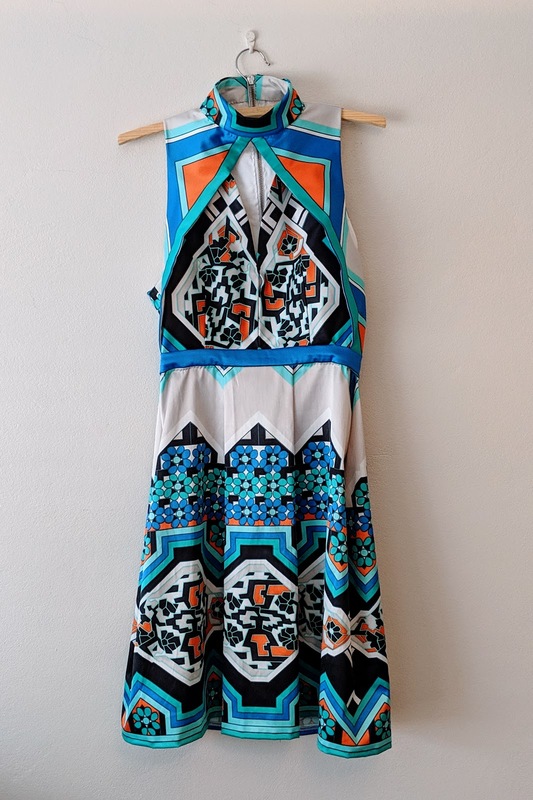 But on days where the temperature is in the mid-20s rather than the high-30s this dress is great. I had this dress planned for more than four years before I made it. I bought the pattern in early 2014. The fabric was purchased way back in mid-2012. I decided they belonged together when I got the pattern but didn't make it until a month ago. 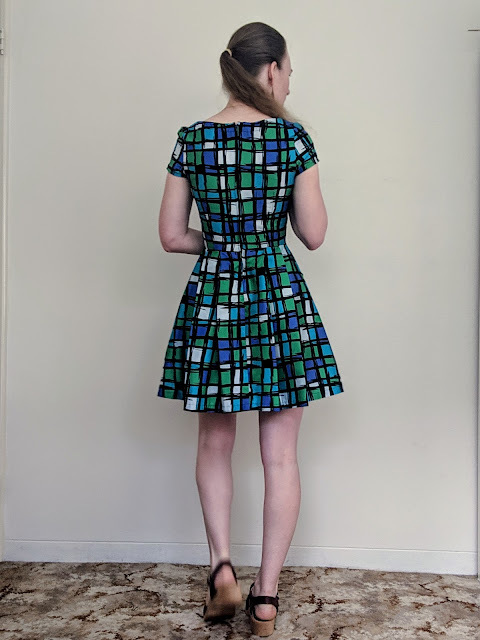 Although I didn't have an overlocker until last year, and it was definitely very handy in sewing up this fabric. I bought the fabric in Benalla when I was doing my PhD research. Benalla was one of my case study locations, and on the last afternoon I had finished up and was filling in time before leaving the next day. There was a small fabric store in town that was in the process of changing over to selling rugs and curtains and getting rid of all their fabric for $5 per (very generously measured) metre. So of course I bought about 7 metres of various fabrics, and this is the last piece left. The pattern is La Sylphide from Papercut Patterns. I made a number of adjustments to the original pattern to fit the image I had for it, but nothing significant. I changed the darts from normal darts to tuck darts to give the bodice a slight blouson effect, which I felt suited the drape of the fabric better. I raised the neckline and removed the tie because I found it sat fairly low when I made the blouse version. 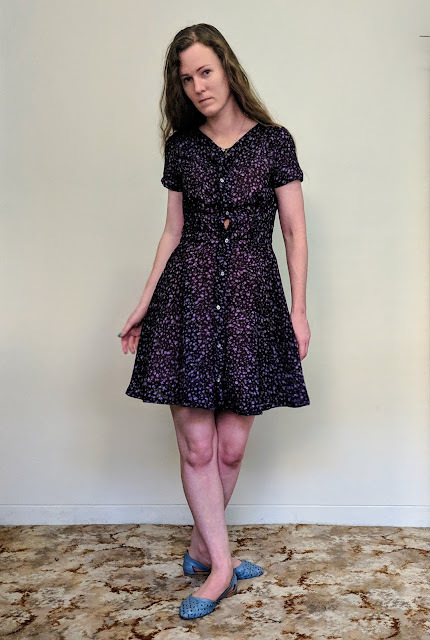 I also shortened the sleeves to make it a summer dress and lengthened the skirt by about 2 inches because Papercut Patterns always seem to be made fairly short. Construction was still very easy, as Papercut have well-written patterns. 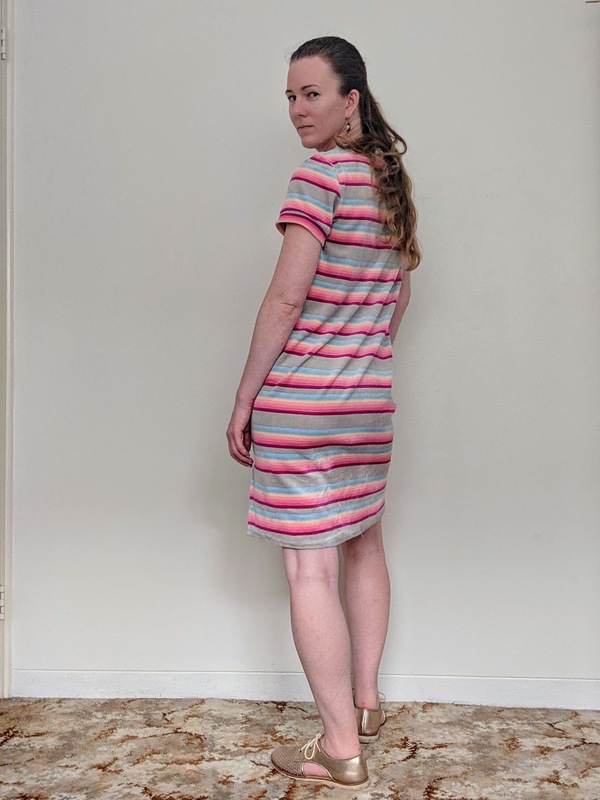 The fabric is a poly crepe georgette so it can get a bit sticky, but it has a great drape and flows nicely which generally means it's airy and cool most of the time. It is prone to fraying, so all seams and hems are overlocked. The colour is a beautiful rich deep purple, with delicate light and mid-purple flowers. 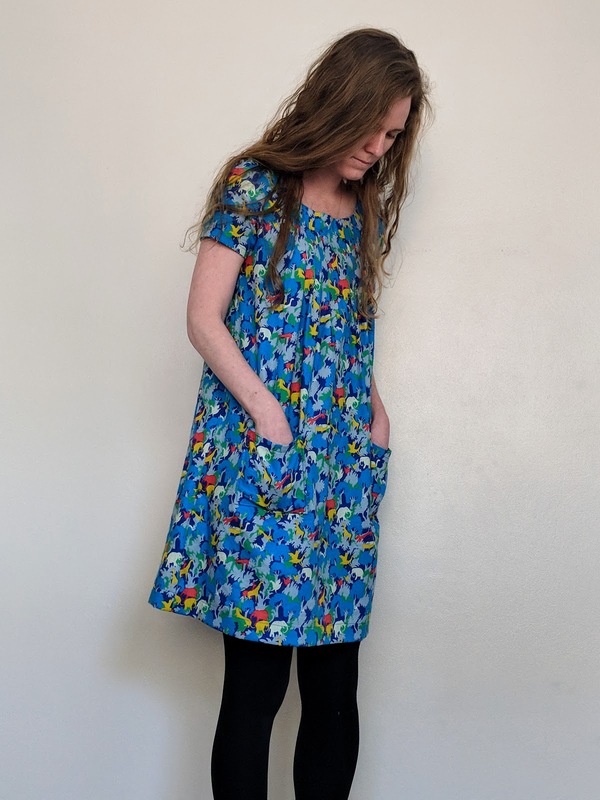 The fabric is quite light and partially see-through so while it's not particularly obvious when looking at it, it does require a slip to be worn underneath. The buttons are from a box of buttons inherited from my grandma. 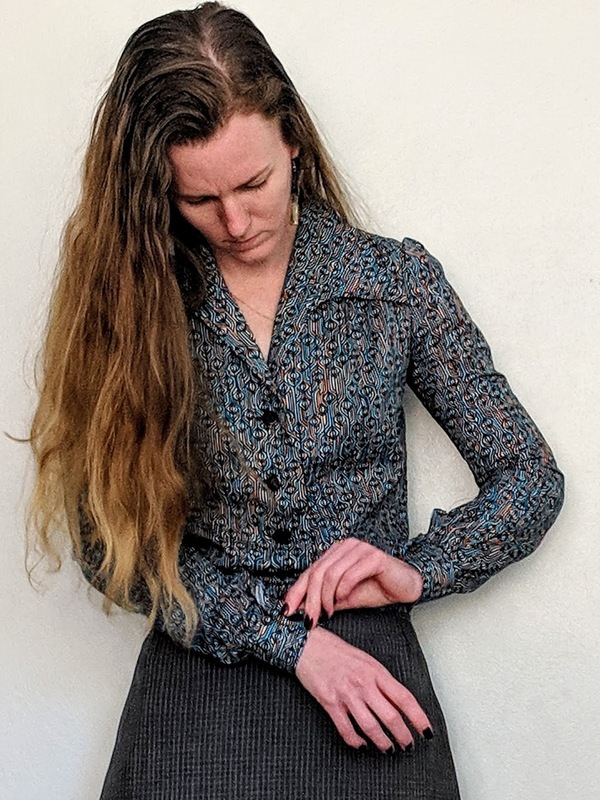 Because the fabric is a georgette that is prone to fraying I didn't want to do buttonholes as I doubt they will stand up to many washes, so the buttons are decorative and hide press studs. I was also unable to insert interfacing on this fabric as it didn't stick when I tried to iron it on, so the bottom of the placket doesn't sit completely straight. This dress has already gotten a few wears since I finished it. 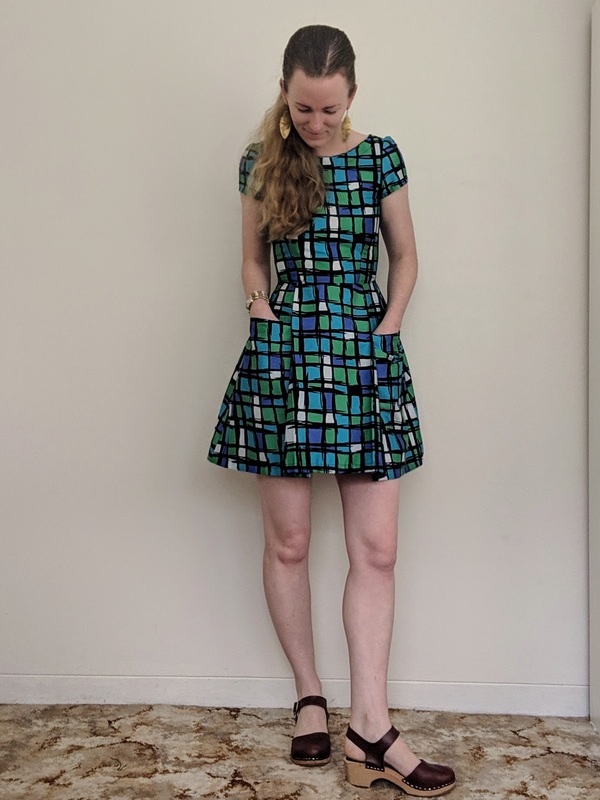 It is nice enough that I can wear it to work, but also works for weekends or holidays, making it very flexible. 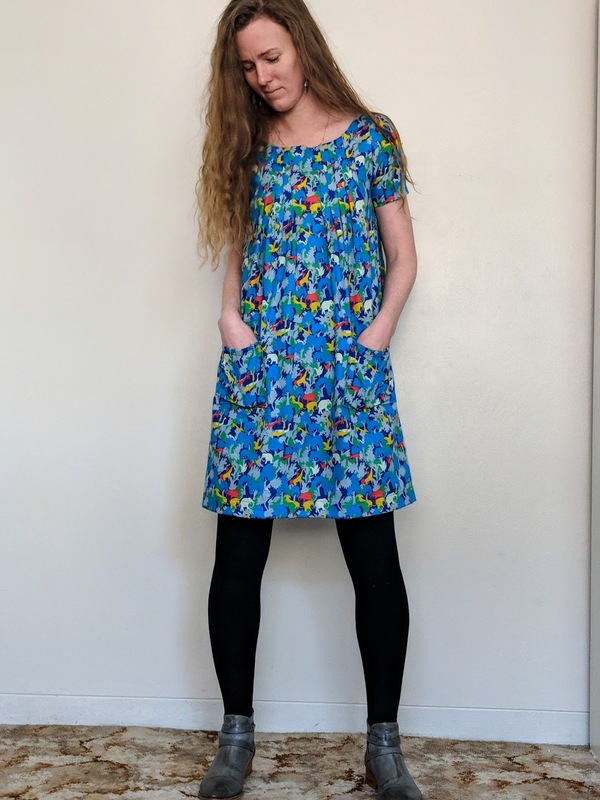 This is the Lorenzo Jungle Dress, a casual winter/trans-seasonal dress. The fabric is a Liberty Lantana called Lorenzo from The Fabric Store. It's 80% cotton and 20% wool, so it's a similar weight to a flannelette but nicer feel and quality. My initial thought for this fabric was to make a pinafore. But the fabric is very colourful and the print pretty kitschy so I was concerned it might be a bit too childish made into a pinafore. 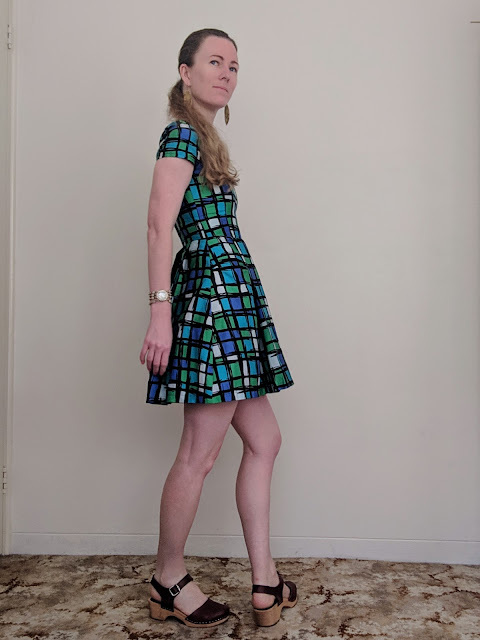 I flicked through my patterns to see what else I had that might work for the fabric and saw the dress on the cover of Stylish Dress Book (pattern E in the book) and thought it could work. I couldn't decide between the two so posted both options on Instagram asking for opinions, and the stylish dress book pattern narrowly won out. I have made this before in a wool a number of years ago and retired it from my wardrobe earlier this year. So I knew it was something I could make easily, and knew the changes I'd want to make sewing it up a second time. Given how loose and full the dress is I decided to lengthen the hem and also narrow the pieces. The front is pleated and the lower back of the dress is gathered, so it was easy to reduce the bulk by placing the pieces over the fold line so that they were smaller. I also cut the pieces straight up the sides as the weight of this material didn't need anything extra. 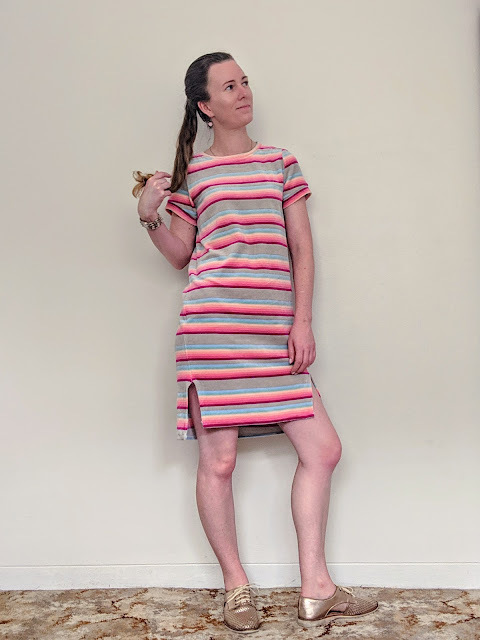 This dress is an incredibly easy make. There are very few pieces, one for the front, two for the back, sleeves and patch pockets. The sleeves are cut a little narrow and do not have much in the way of fullness and the sleeve cap. 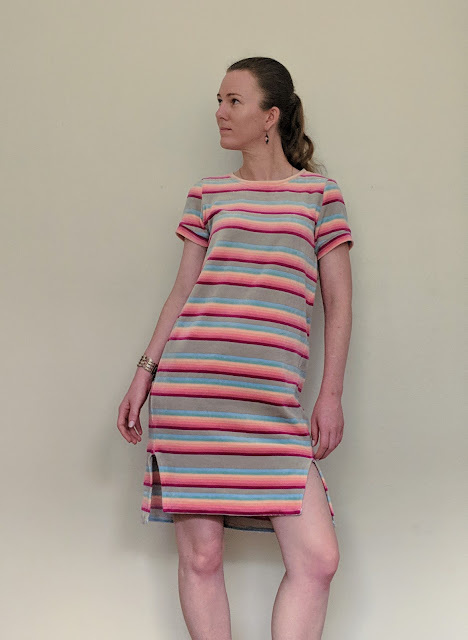 Combined with the loose trapeze shape this can mean that the dress rises up when lifting up your arms, another reason why I lengthened the hem. For the hem I added around 10cm so that I would have enough extra fabric there to do some trial and error on deciding the right length. 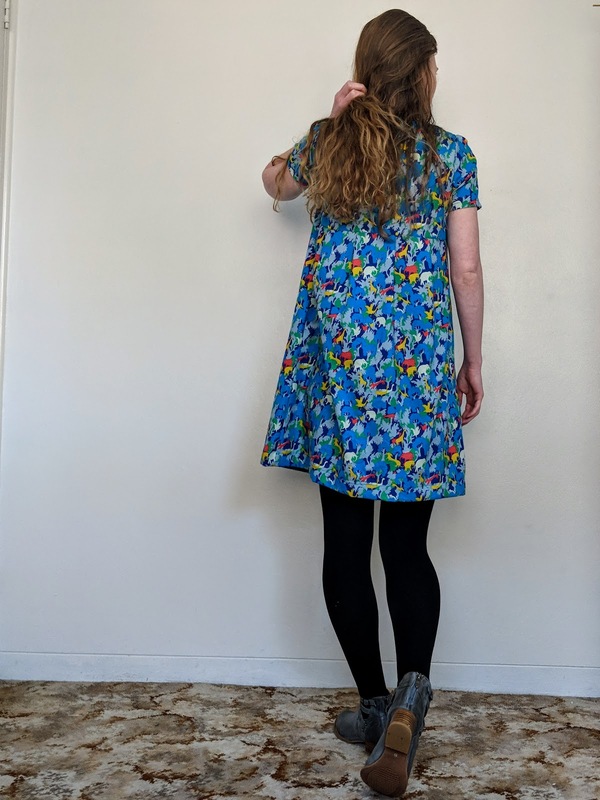 In the end I think this dress struck a good balance in using the kitschy fabric but not turning out too childish. It's a fun print, and while it's probably designed with childrenswear in mind, I love a great print and don't think there's any problem with adults wearing something bright. This definitely isn't work wear, but I think it will find a good place in my wardrobe. I made jeans!And they're colourful and they fit and they look reasonably professional. And they're jeans that I made! It's definitely an exciting achievement. Exciting enough to jump for joy. These are the Ginger Jeans from Closet Case Patterns. I cut out the size 2 although I should be a size 0 - I measured the test square and discovered that it had printed slightly under scale. I've never had that happen before with a digital pattern before so I'm not sure what went wrong, but fortunately it was as easily solved as cutting out the next size up. I'd also printed the low rise version but decided I wanted them high waisted. Instead of printing out the high waisted version - or even just the pages for the waist - I simply sketched the seams for size 2 up to the top of the size 20. I've been planning to make jeans for a while. I had planned to make some last year and bought the pattern and a different piece of denim, but it was more expensive and I was too daunted to use it. So instead I bought this cheaper denim. The fabric is a very stretchy and lightweight denim from My Hung fabrics. It came in both this watermelon red and a rich aqua, but I decided I liked the watermelon shade best. The pattern recommended basting the pieces together first and trying them on just to check for any major fit issues. I normally don't bother with any of those precautionary steps - I've never made a muslin in my life - but I decided this time I would be good and follow every step. I tried them on and the fit was great. Even my sketching the waist from low rise to high rise had worked well! The pattern is generally well written with clear instructions and accompanying pictures. However, I did have issues with the fly. Because I tend to find the fly tricky to do, I made sure I read through the instructions and look at the pictures before sewing and also made sure each step that I followed exactly. However, when I undid the basting stitches it wasn't centred. So I unstitched the lefthand side of the zipper, repinned it further in and stitched it back in so it sat flat and straight. I only have the one sewing machine so I couldn't do what the pattern recommends and have one machine threaded with normal thread and one with topstitching thread. Howver my machine does a spot for an additional spool pin, so I threaded jeans needles with both normal and topstitching thread, put the normal thread on the normal spool pin and the topstitching spool on the additional pin so I only had to change the needles rather than rethreading. I used a red topstitching thread because I haven't really used it before and didn't want it to show up too much in case it was wonky and uneven. I decided I wanted wavy lines for the back pocket topstitching which I marked on with tailor's chalk and then very carefully tried to follow my lines. They aren't perfect, and my other topstitching definitely isn't even straight lines, but it's probably better than I thought it would be. The pattern is for skinny jeans, but they don't taper in right at the bottom but are instead straight from the calf. 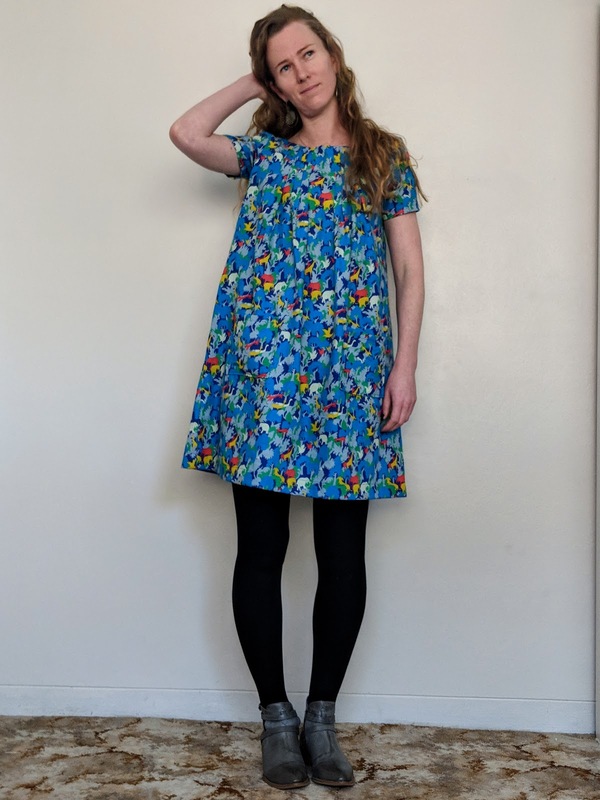 This is the only thing I dislike about the pattern itself, and if I use it again I will definitely change it so that they are skinny all the way down. However, this is only a minor issue. I also would make the waistband piece smaller and more tapered. 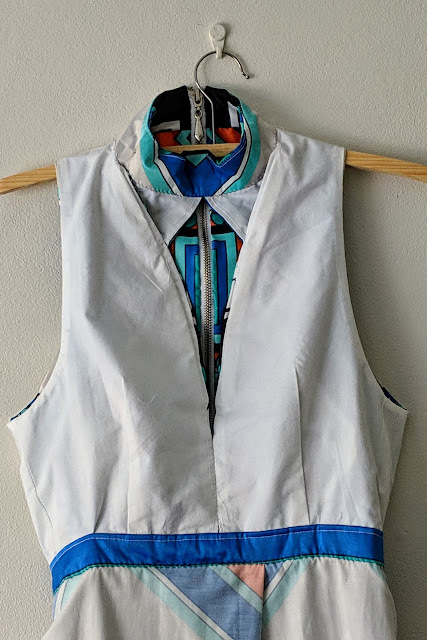 The pattern says the piece is slightly longer so that it can be trimmed and adjusted to each person's waist size, and while I did trim it shorter I found that after I'd ironed my interfacing on it stretched it slightly out of shape. Ironing the waistband after it was inserted helped even the slight waviness a bit, but next time I'll make the waistband a bit too small so that it can stretch after insertion. Anyway I am very proud of myself making jeans. It was daunting and definitely more involved than most sewing but surprisingly not hugely difficult. And I'm really happy with the fit and how they turned out. I'm even tempted to go and buy the aqua denim and make a matching pair. Akthough maybe not right away. 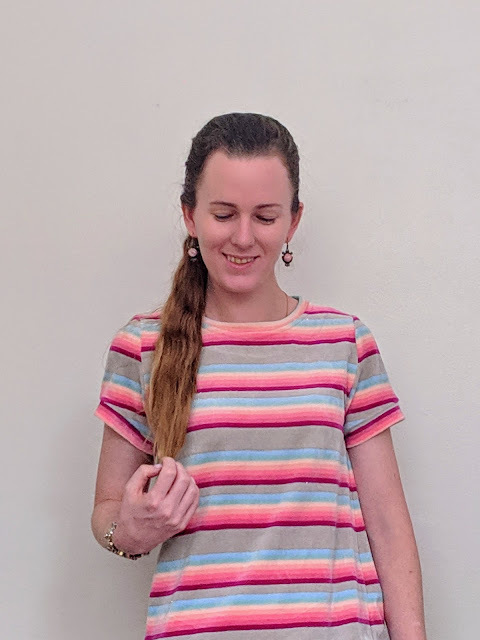 Although it's been a while since I posted, I have done a fair amount of sewing in the past few months, and even photographed a few things, but haven't gotten around to editing the photos and writing about them. 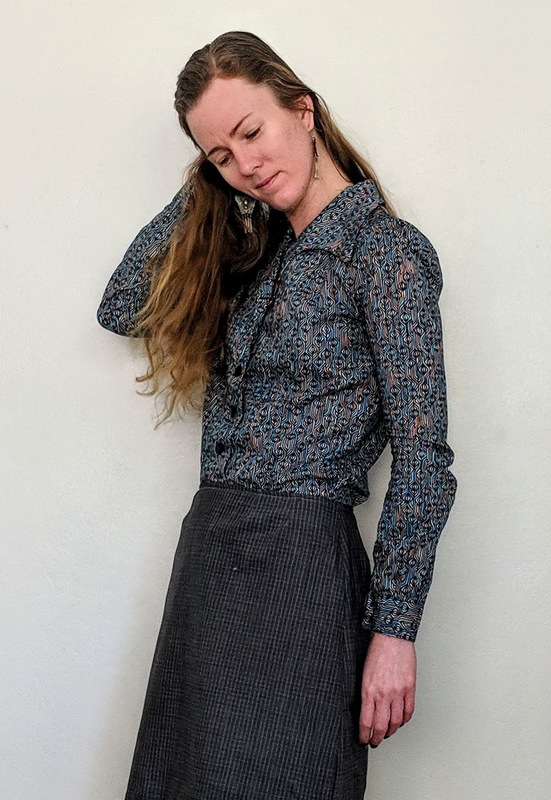 This blouse is one I started making in August, although it took over a month to finish. The fabric is a Liberty of London Tana Lawn from The Fabric Store. 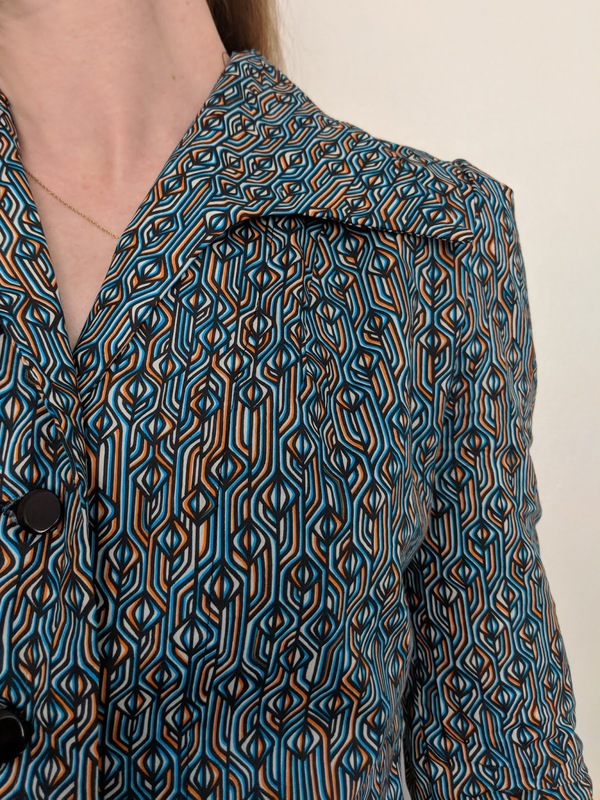 The print on the fabric has an art deco feel, so my initial plan was to use a 1930s blouse pattern. 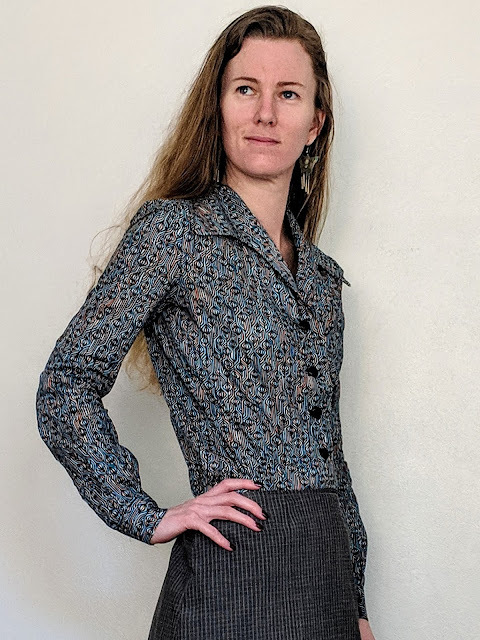 Unfortunately the only 1930s blouse pattern I own needed much more fabric, so I took a look back through my patterns to find something more classic that would let the fabric do the talking. 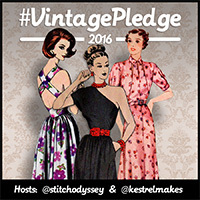 The pattern is a re-released 1940s pattern from Simplicty, number 8243. Despite the stylised art on the pattern envelope, the sleeves are nowhere near as full. 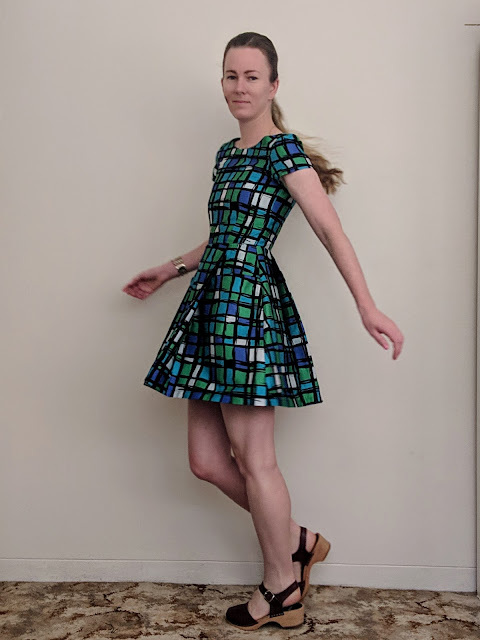 I was almost unsure about using this pattern because I didn't want big sleeves, but in the end the fit of the pattern was much slimmer than the drawing suggested. 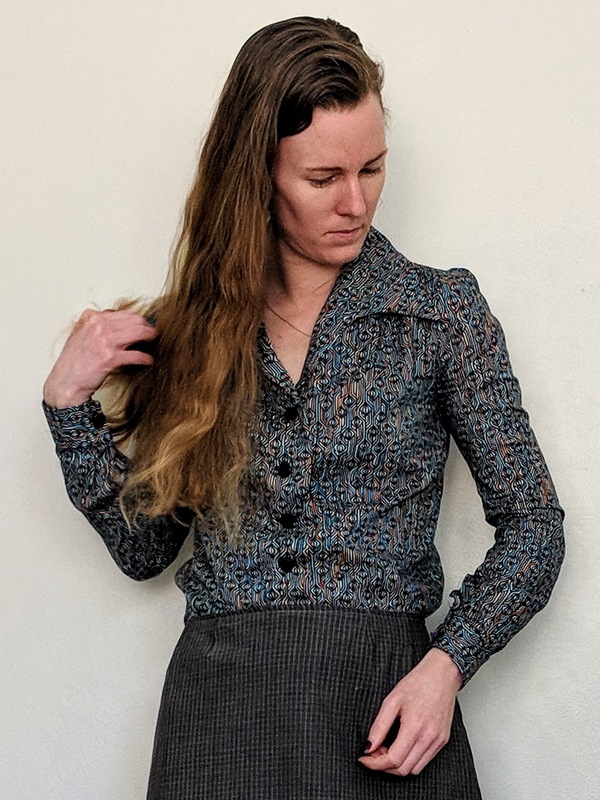 It took me longer to finish this blouse than I'd planned because of the problems with the cuff. 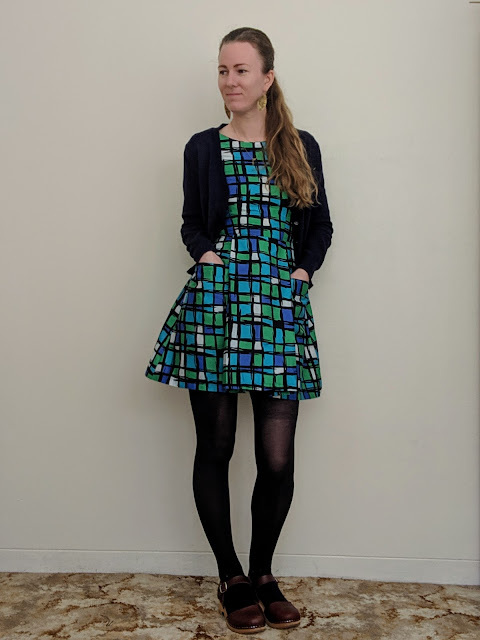 I had worried that I wouldn't finish it in time to wear before the weather warmed up, but since finishing I have been wearing it to work regularly. The Liberty fabric is soft and comfortable, so it's still comfortable to wear the long sleeved blouse in Spring. Hi, I'm Pam, from Sydney, Australia. 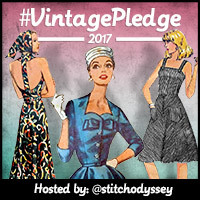 Welcome to my blog of sewing and maybe other stuff if I feel like it.